July Networking Event: "Reward, Recognition & Retention of volunteers"
Are you considering a new career or would you like a promotion in 2015? Then consider studying with the SVM. The SVM offers a range of qualifications and public PD workshops that can enhance your career. The School also offers a range of professional development workshops that it can customise to meet your needs. Call today on 02 9261 3600 to talk to someone in the School about developing your staff. It was my great privilege to take part in the 2015 Vinnie's CEO Sleepout and to learn in a very small way, some of the challenges of homelessness. Thank you to all who supported me in my fundraising efforts. We at The Centre have been pleased to welcome on board new staff over the past few weeks. Lexie Busby has come on board as Events Coordinator and Jane Horvath as our new Manager: Member Services and Corporate Partnerships. We are really looking forward to implementing the great ideas these two bring to our organisation. Thanks to everyone who has already renewed their membership for the next 12 months. We look forward to seeing you at our events and helping you get the most out of your membership. Our online membership sign-up option has been popular, and many of you have asked about how to book the free training session offered to those who pay before 17 July 2015. Our membership team is progressively contacting those members eligible for a free training session this week to book you in. For those who are yet to renew, please get in quick (before 17 July) so you can take advantage of our free training offer. Complete a membership form and return to membership@volunteering.com.au and a membership renewal invoice will be sent to you. If you have any questions or would like to further discuss you membership renewal, please email The Membership Team on membership@volunteering.com.au or call 02 9261 3600. Our Training Manager Judy Munn attended an Australian Government briefing for NFPs on the Work for the Dole program and how it will work from 1 July 2015. Work for the Dole (WFTD) intends to give jobseekers the opportunity to learn new skills to improve their chances of getting a job and helps them return to the workforce. From 1 July 2015 jobseekers that are registered with a JobActive organisation and are on income support for 6 months or more, will need to take part in a 6 month Work for the Dole activity with a NFP or government agency. Funding is shared between the JobActive provider and the WFD host. Total funding is $1,000 for an individual "placement" and $3,000pp for a group based activity (shared between hosts and JobActive). If a WFTD participant leaves before the 6 months placement period, the JobActive provider will seek to replace them with another participant for the remiander of that 6 month period. There is no extra money provided because they fund each 6 month "placement" rather than each person . For more information it is recommended you contact your region's WFD Coordinators. They work with the JobActive provider and the Host to match participants to work roles and they will help organisations to develop their WFD program. New ABS data shows volunteering rates in NSW and Australia are falling for the first time in almost 20 years with 75% of people surveyed saying they feel rushed or pressed for time. The Australian Bureau of Statistics’ 2014 General Social Survey results, released this week to provide a snapshot of the key indicators of wellbeing, show volunteering in Australia has fallen by 5% since 2010. The Centre's CEO Gemma Rygate said Australians are still keen volunteers with 5.8 million Australians (or 31%) volunteering in the past 12 months. “Alarmingly though, the ABS data also shows that fewer Australians are volunteering with 31% of Australians volunteering in 2014, which is down from 36% in 2010," Gemma said. Contributing to the decline is Australians’ feeling time-poor with the ABS survey showing 45% of women and 36% of men reported that they are always rushed or often pressed for time. “When you consider that females are more likely to volunteer than males (33.5% versus 29.1%), it seems our traditional, core volunteer base is shrinking because women, especially, are overstretched,” she said. “These statistics highlights two things we need to do in the volunteering sector. "The first thing, is we need to ensure we retain the great volunteers we do have and second, we need to find new ways of making volunteering more accessible for time-poor people. "We look forward to working with our members on understanding the implications of this new data, and how to best respond." This supportive workshop provides the top ten tips and techniques to become a better communicator and speaker at formal and informal events. This interactive and case study based workshop provides an overview of the role of a volunteer director and their key duties. It also explores legal matters and governance trends for NFP Board Members. Are you a volunteer magnet with a 5 star approach to keeping your volunteers? This 1 day workshop will assist you to refresh and review your recruitment practices and provide you with the tools and techniques to understand the motivations of volunteers and explore the concepts of engagement. learn from others in the community & volunteer sector. The Centre for Volunteering presented an informative Bridge to Volunteering for Corporate Volunteers to Kelloggs staff at their Health and Wellness day. 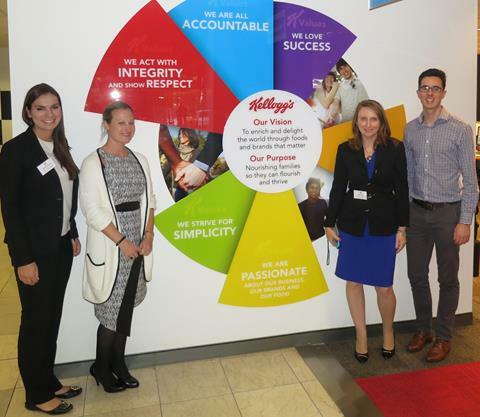 This educational seminar was introduced to educate Kelloggs staff about their Volunteer Leave Program and the many services that The Centre for Volunteering and Volunteering Sector can provide to their staff. NSW Premier Mike Baird has announced that the NSW Government will provide travel concessions to asylum seekers to help them access important social and community services and increase their participation in our society. The concessions will be the most generous of any state in the nation - equivalent to the concessions currently available under the Gold Pension Concession Card. The concessions will apply from 1 January 2016. "I am of the view that Australia is the lucky country and we have a responsibility to help those who have nowhere else to turn," Mr Baird said. "NSW is Australia's economic powerhouse, but there is little point in having a strong economy unless we use this strength to help the vulnerable among us. "NSW has shown we are prepared to help asylum seekers in our community and we want to do even more. "This group is one of the most vulnerable in our society, often living below the poverty line. Evidence suggests that lack of access to dispersed services is a key impediment to their health and well-being. deteriorating mental and physical health. "Until now, it has been the non-government community agencies funding transport for asylum seekers in NSW. This change allows those NGOs to be putting more of their limited resources into food, counselling and housing - where it is needed most." Transport Minister Andrew Constance said eligible asylum seekers would receive a $2.50 ticket that provides for all day, multimodal travel. "We are providing these travel discounts to asylum seekers to help them participate more fully in our society and access a range of social and community services," Mr Constance said. "Many of the asylum seekers in NSW are at the very start of the process of applying for a protection visa. This means they need access to a wide range of services in order to navigate this process and rebuild their lives." 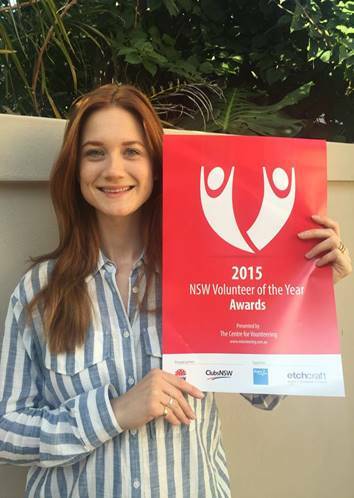 With only 3 weeks left to nominate for the NSW Volunteer of the Year Awards - Harry Potter star Bonnie Wright (pictured) gets behind the 2015 NSW Volunteer of the Year Campaign. As a volunteer herself Bonnie Wright aka Ginny Weasley from the Harry Potter films said she is constantly inspired by the breadth and impact of volunteering across our society. Bonnie is a volunteer for Oxfam UK and the Global Poverty Project and urges us all to nominate the volunteers in our lives who give so much to improve the lives of others. “Celebrating the time and efforts of these quiet achievers is paramount”, according to Bonnie. The NSW Volunteer of the Year Awards recognise and celebrate the outstanding efforts of the two million plus volunteers in NSW and promote the importance of volunteering to the community. All nominees will be formally recognised at an Awards ceremony. 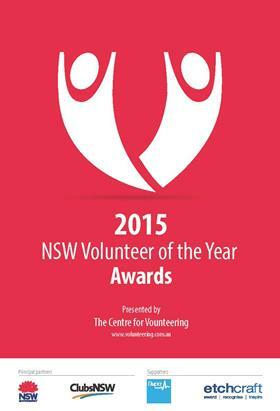 Now in their ninth year, the NSW Volunteer of the Year Awards, run by The Centre for Volunteering are generously supported by ClubsNSW, the NSW Department of Education & Communities and Bupa Aged Care. Every nominee will be publicly recognised at one of the 20 Regional Award Ceremonies to be held from early September to early November across NSW. This is your opportunity to say thank you to these wonderful individuals who do so much to make a difference in the lives of others and the overall spirit of the community. How can your NFP organisation best recognise, reward and retain your volunteers? Volunteers lift up our communities and are an integral part of the framework of many NFP organisations. Without volunteers, most NFP organisations would simply not be able to achieve what they do and some would even fold. A key part of managing volunteers well includes having the right recognition and reward program in place. Recognition and reward programs help keep volunteers motivated and engaged in your organisation and its work. And it’s much easier to retain a volunteer workforce that is motivated, happy and engaged! All volunteer-involving organisations – no matter how big or small– can develop an appropriate rewards and recognition program for their volunteers. There are many no-cost and low-cost ways of recognising your volunteers – often the smallest things make the biggest difference. Hear about the strategies other organisations use in our July Networking Event. Come along to share ideas and leave armed with some great tips to help develop or improve your organisation’s volunteer recognition, reward and retention program!